Placed right in between Black Friday--the traditional day when businesses hope to enter into the "black" of their financial year, and Cyber Monday--the biggest day for online shopping as people return to work and use those faster computers to place their holiday web orders, was the quiet beginning of the church's Advent season this weekend. Saturday night we entered into this year's Advent season with two new sung mantras by a small choir, a lovely reflection (by two of our oblates) on the setting of "darkness" in so many of the scripture events, and the transformation of the chapel into Advent time. For the next 25 days we will hear the haunting words and canticles of Isaiah and the other prophets foretelling the coming of the Messiah--God with us. 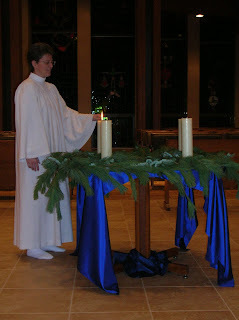 Sister Katherine lights the candle for the first week of Advent. 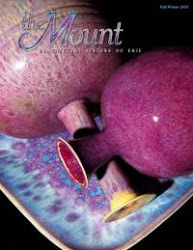 "A shoot shall come out from the stock of Jesse, and a branch shall grow out of his roots. The spirit of God shall rest on him, the spirit of wisdom and understanding, the spirit of counsel and might, the spirit of knowledge and the fear of God. Righteousness shall be the belt around his waist, and faithfulness the belt around his loins. The wolf shall live with the lamb, the leopard shall lie down with the kid, the calf and the lion and the fatling together, and a little child shall lead them. The cow and the bear shall graze, their young shall lie down together; and the lion shall eat straw like the ox. The nursing child shall play over the hole of the asp, and the weaned child shall put its hand on the adder’s den. They will not hurt or destroy on all my holy mountain; for the earth will be full of the knowledge of God as the waters cover the sea. On that day the root of Jesse shall stand as a signal to the peoples; the nations shall inquire of him, and his dwelling shall be glorious."